We are acknowledged for manufacturing and exporting of our wide variety of these Heavy Duty Clamps to our extreme customers. These are well known for its characteristics such as sturdiness, rust free and accurate shapes which can hold high pressures. In addition to this, these fine quality Clamps can be availed by the esteemed customers from us at affordable prices. We are one of the famous manufacturers and the exporters of the Heavy Clamps in the present market. Our products are offered in various widths, thickness, material and surface finishing. These products are manufactured using premium quality raw material and contemporary techniques. We offer these products to our clients at a very competitive and market leading rate. 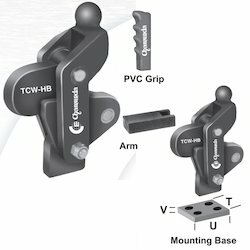 Looking for Heavy Duty Clamps ?